Hello everyone, hope you’re all doing well. 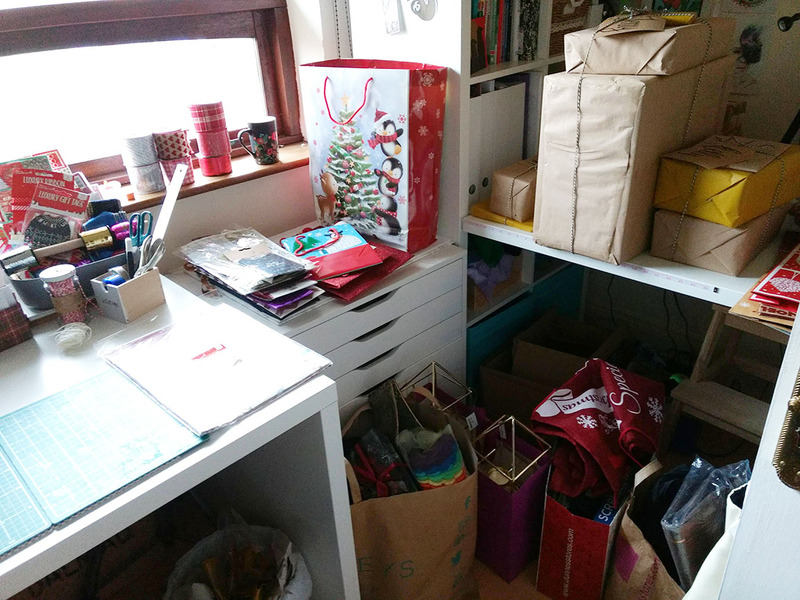 There’s a reason I try to have Christmas crafts finished in November – the room gets taken over by wrapping paper, bags of gift bags and presents waiting to be wrapped in December! I’m still living at home with my parents at the moment so considering they were kind enough to let me take over a bedroom and indulge in my craft obsession, I feel I can’t say no to letting my mum take the room over in December for all her Christmas wrapping! Okay, looks pretty much the same as normal to be honest but I swear I did move things around and actually get rid of some things! A lot of the small changes I made in the craft room this year came about because Christmas foods often come in really nice tins and I wanted to use the tins for storage – such as the long, narrow After Eight tin that I’m storing clear acrylic blocks and die cutting machine plates in. They had been stored in a different box before but I used that elsewhere – now I just have to find a suitable replacement for that cardboard cat food box I have my score board in. I’d say the biggest changes came in the arrangement of the shelves on the left hand side of the Kallax unit. Before, my mum had her craft supplies on one shelf but I’ve given her more space almost three shelves now (though one of them is a shared shelf with craft kits that we both might use – the biscuit tin that looks like a sewing kit is filled with those small needle felting kits I get from my friend in Japan a lot). She now has a shelf with all her needle felting and rug making materials (the box filled with different boxes) and a shelf for her art materials (as I’ve been trying to get her to draw more). In terms of all my own stuff, very little really needed to be moved around – I changed the order of some of my paper folders and switched around some of my stamping and die-cutting stuff but that’s about it. I didn’t feel the need to make any major changes which I thought I might – actually, it’s a nice feeling, makes me think I’ve found the best layout – for now at least because we all know that things priorities change. But for now, my craft room is organised for 2019 and I look forward to spending some time in it! It looks so organised and tempting! I love the sloths collection too. Thanks! A growing sloth collection being helped on by my pen pals now 😀 I feel like I have so many craft supplies for tons of different crafts from card making to needle felting that keeping things organised is essential for knowing where things are. Looks so organised. Great job! I try my best to keep it organised! Especially when you have things in boxes and drawers, I think it’s important to go through things regularly so you remember what you have. When things are hidden away, it’s so easy to forget what you have and neglect your supplies. We don’t have space for a craft room as we just have a one bed flat, so I use the dining table in our front room. We have one IKEA unit (the Flysta which is a bit smaller than a Kallax) for my craft stuff but it is also stacked in the bedroom, waiting for another IKEA unit. It’s not that I have lots of stuff really, well, I don’t think so anyway, it’s that we have such a small home. It’s good that you and your Mum share stuff. My Mum is hundreds of miles away. 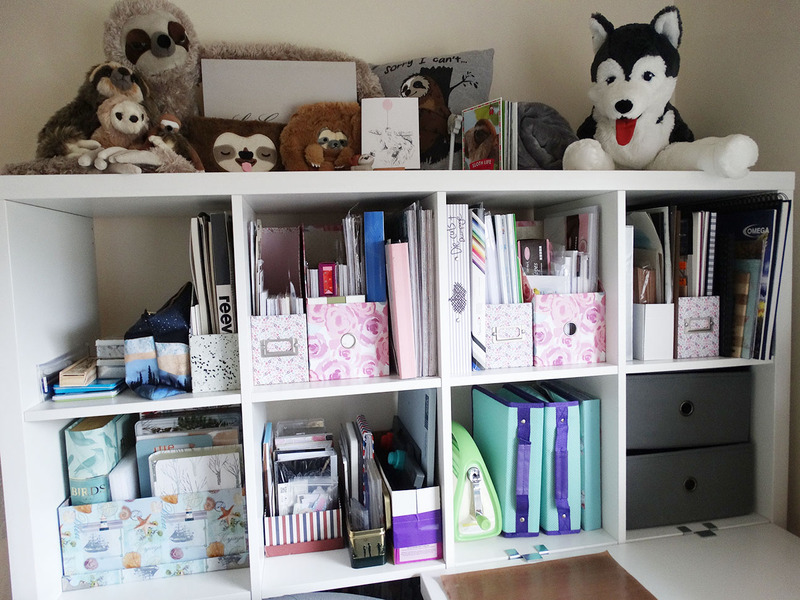 Finding the right space for storing crafts can be so hard – I remember when before I had a spare room to store stuff in I was just stuffing things in corners of shelves and baskets in my bedroom and had no proper storage at all. I’m really lucky to now have a whole room dedicated to crafting as it does allow me to work on stuff at my own pace and not have to worry about leaving things out on the table. Have you seen those crafting cupboards that open up and are filled will shelves and drawers and a fold out table for crafting? They look amazing and if I didn’t have a craft room I would so be wanting one of them even though I imagine they’re incredibly expensive but they look so cool!